You know, to be honest, we prefer the 550 Coupe to the Spyder. Especially when it's all Panamericana'd out. We just 'bout choke on our tongue over those cars. 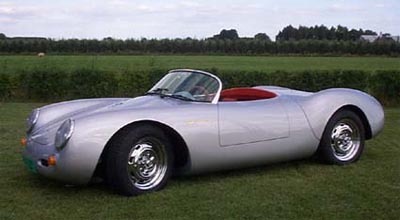 Reader Alex, offended (and rightfully so) by the 356 custom job we posted yesterday tipped us off to the Chamonix Spyder, which features a 'glass body built on a tube frame with a variety of VW-based mills to choose from. Plus, as Alex points out, "And if you want to paint it turqoise, fill it with dalmatians and chop in in half, at least no one will wince at the loss of automotive history." Somebody needs to get on that.